The papers of one of Oregon’s most prominent literary figures, who popularized Oregon Country history and Sacajawea as a heroine of the Lewis and Clark Expedition. 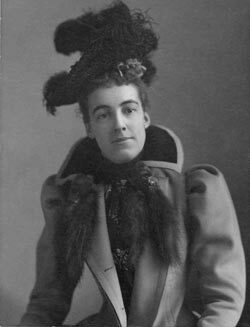 Eva Emery Dye (1855-1947) was a native of Illinois who worked her way through Oberlin College as an elementary school teacher. She married lawyer Charles Henry Dye in 1882 and came with him to Oregon City in 1890. She soon became a prominent figure in Oregon’s literary and historical circles, and her extensive writings include McLoughlin and old Oregon (1900) and The conquest : the true story of Lewis and Clark (1902). Among their many civic activities, Dye and her husband jointly founded the Willamette Valley Chautauqua and were involved in the state’s Republican Party. Eva, with her husband’s full support, took an active role in the woman’s suffrage movement, the Sacajawea Statue Association, and the effort to preserve the John McLoughlin house in Oregon City. The Dye papers (1776-1997) consist of correspondence, ephemera, manuscripts, literary journal, research notes, and scrapbooks. Also included are family papers. The voluminous correspondence includes prominent figures in Oregon’s cultural and political life, as well as those active in the suffrage movement. OHS also holds an associated collection of Dye’s family photographs (Org. Lot 1017).